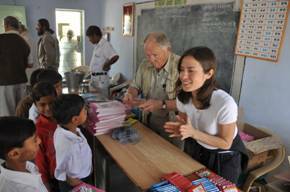 "For years we’ve been dreaming of joining Relief Workers International on its medical trips through India. The work: helping doctors provide medical care to hundreds of people in several different villages. The rest: Accommodations are comfy tents in breathtaking surroundings with visits to ancient towns and old forts. The site will soon list upcoming trips; in the meantime, reading about the work is singularly inspiring." "Alexander Souri, executive director of the award-winning VolunTourism Company, Relief Riders International (RRI), announced today that he is launching Relief Workers International (RWI), a new venture that will bring travelers to Gujarat, India." Interested in the business aspect of our relief work? Check out Judy Martin’s article featured in the March/April issue of Motto Magazine. I would like to personally thank all of you for your kind messages of support as we worked to launch Relief Workers International. After 4 years of conducting innovative humanitarian expeditions on horseback, we were delighted to go back to the drawing board to create a different humanitarian travel experience that required no riding skills. Building on our prior success, we designed our Relief Workers trip to radiate out from a central point allowing time each day for us to integrate, reflect and breathe in the beauty of our whole experience. As all of you may remember the attacks on Mumbai last November made us face the very real choice of cancelling our inaugural trip. Transcending our fears and deciding to continue was grounded in our willingness to expand and reach out to others in the hope of overcoming this overwhelmingly tragic incident. The decision to move forward was met with a host of magical meetings and miraculous experiences serving to help overcome our collective grief. The beauty of this experience was witnessing the numerous communities come together for a common purpose with no other agenda than to help people; a humbling reminder of the power of showing up, reaching out and assisting others wherever we might find ourselves. 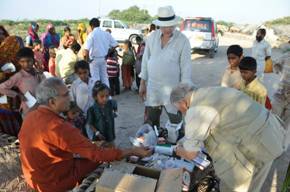 Please click here to view a beautiful slideshow of Relief Workers International’s inaugural trip in Gujarat. Our intimate and informative talk with Honorary Secretary Dr. Madhuben Naik of The Indian Red Cross combined with a stirring tour of Mahatma Gandhi’s Ashram served as an inspiring beginning. 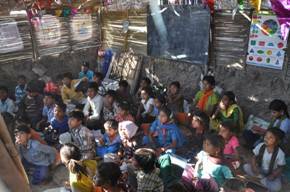 We were thrilled to be able to serve 2600 villagers through our humanitarian programs. 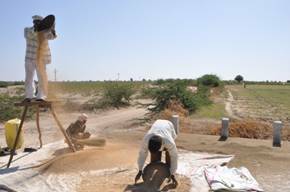 Our medical camps at both the ancient village of Zinzuwada and the Salt mining town of Kharagodha proved efficient as we offered 1000 villagers treatments in two days. An afternoon, impromptu mini mobile medical camp for the semi-nomadic Mir community living by the side of the road in Dasada, allowed us to treat 70 villagers, 50 of whom were children. Nothing is more heartwarming than the joyful and colorful receptions we received from the 1500 children in our Pediatric and Educational camps held at local schools. With their bright eyes and touching smiles, they embraced us in their excitement and curiosity. After 5 years of being involved in these programs, nothing is clearer to me than realizing the impact each one of us can have by simply showing up and reaching out. The joy of doing this type of work is meeting likeminded people with a sincere interest in co-creating sustainable programs and long term solutions. Upon learning of our relief mission, INTAS Biopharma Director, Mr. Mani Iyer took this opportunity to create social awareness among his executive team. Through personal experience Mr. Iyer explained that truly helping people is about engaging communities, not just providing financial support. INTAS Biopharma executives not only provided most of the medications free of charge, they came to experience first-hand the human impact of their actions at our medical camp in Kharagodha. This prompted the young INTAS Executives to move towards the possibility of having them continue our Pediatric and Educational programs throughout the year. We stayed at Rann Riders Resort, a garden paradise shared with exotic flowers and a multitude of rare songbirds. From here traveling into the vast beauty of The Rann gave us an unparalleled experience in stillness and perspective that wove itself through the entire trip. Special New Year’s trip: December 22nd, 2009 through January 2nd, 2010. We hope you will join us one what promises to be a unforgettably heartwarming experience. Thank you so much for all of your wonderful e-mails. So many of you have been writing to inquire about upcoming Relief Rides. We are pleased to announce that Relief Riders International is offering two exciting new Relief Rides this winter. We have found an outfitter who is delighted to be working with Relief Riders International and will be providing excellent Marwari horses. These Relief Rides will be taking place in semi-mountainous and desert terrain close to Udaipur and Jodhpur in Southern Rajasthan. Please understand that we have not offered Relief Rides since 2008 and meanwhile have had a lot of interest. To avoid disappointed, please contact us sooner rather than later to ensure your space on the ride. Expect to receive a Relief Riders International newsletter with more details. 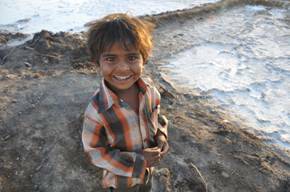 We hope you will join us either in The Rann or horseback through Thar Desert in India this winter. RWI Mini- Medical camp for the Mir (semi-nomadic)community in Dasada. 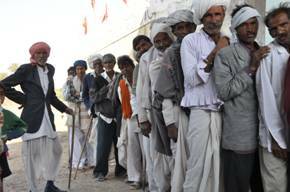 Men's patient registration line at RWI's free Medical in Zinzuwada, Gujarat. 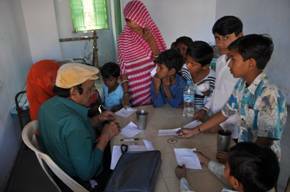 Dr. Jain treating children at RWI's Free medical camp in Zinzuwada, Gujarat. 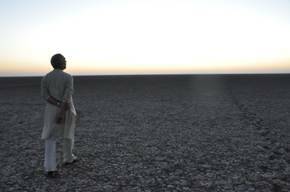 Dr. Arora walking in the Rann.